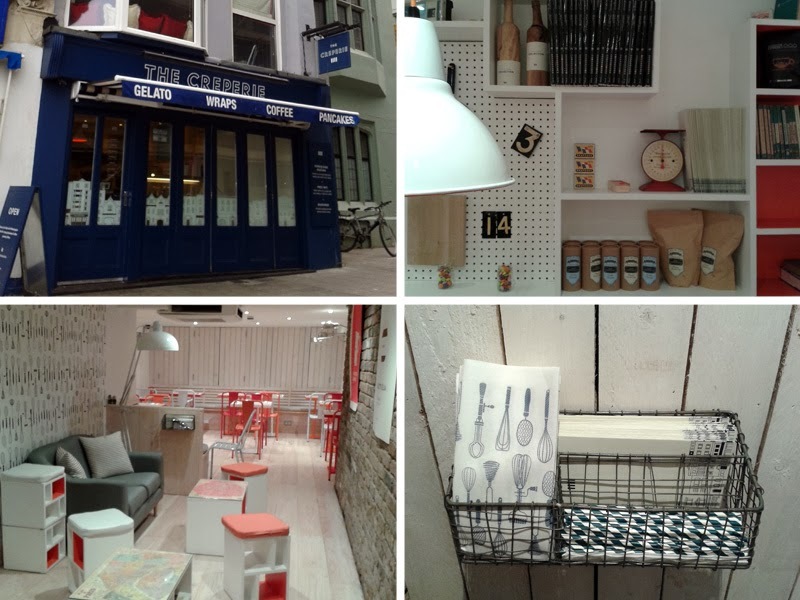 The Creperie is a dream for those with an eye for design. The website and interior have been exquisitely crafted. As a branding designer this would have been a dream job, details are everywhere from the striped paper straws, branded napkins and plates and logo plaques on the table. Stylish, relaxed with the right twist of quirky, it's an absolute pleasure to dine in. As well as all of that (and I could go on believe me) Brighton was really desperate for a creperie. I just love the things and their versatility so that they can be adapted for all times on the day. 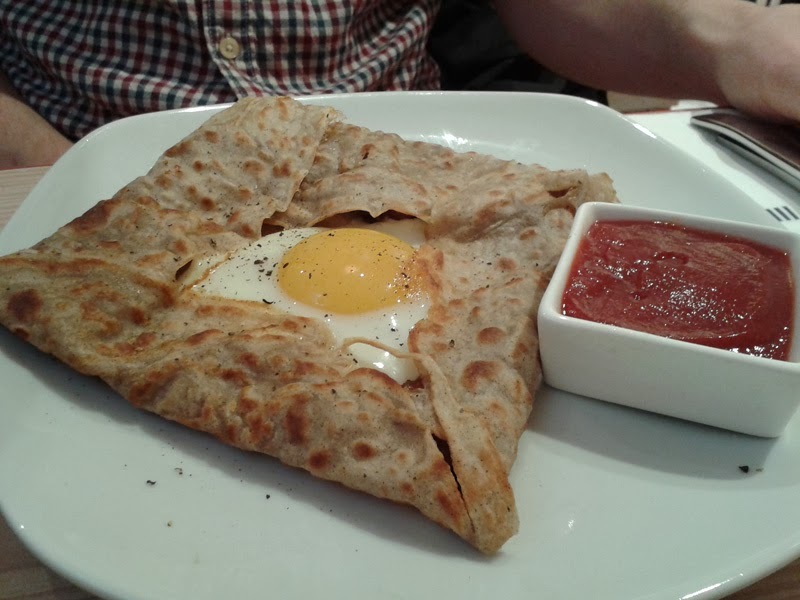 I'm not really a cooked breakfast fan, you won't find me down the greasy spoon for sure, so The Creperie is an ideal start to my day. 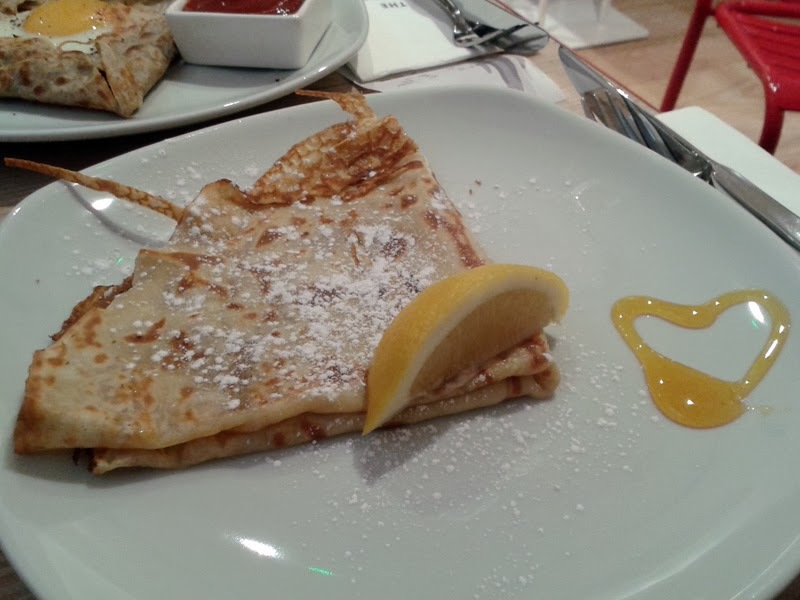 I went for a classic sugar and lemon crepe with my Small Batch coffee which I thoroughly enjoyed. The crepe was paper thin, delicious and simple. At just £4.95 and served with either juice tea or coffee, I think it's a bit of a bargain as most cafes will charge a few quid for a good coffee anyway. Mr GF would probably die of starvation on just my simple crepe to start the day, so he opted for the heartier breakfast crepe with a poached egg and bacon. Amazingly this was also £4.95 with a drink which I think was either a print mistake or too cheap. Crisp streaky bacon was tucked all around the perimeter so it was a decent breakfast. The only negative was the wastage from such a huge portion of ketchup. Although tucked away, I think The Creperie will do well here in the summer. The menu has been well thought through (designed and created by Karen Samuel formally of Food For Friends). They have a good selection of gelato from locals Gelato Gusto and there are plenty of sweet options. Savoury-wise there is a separate hot and cold menu and I will be returning to make a good dent into both for lunch. You could go classic with a twist with locally haddock in a creamy cheese sauce or wild mushrooms, crème fraîche, white wine, dill and spinach leaves. There are some more unusual options like curry or a fajita inspired galette but really, something to suit all moods. You would be hard pushed to spend more than £8/9 on lunch here, especially with the take away prices, unless you double or triple up. Which, with the style and attention to detail the owners have gone into is ridiculously good value.